Swords forged by dragon magic. Ancient rivalries flaring into all-out war. Dragon Riders caught up in a clash of hidden powers. A world hangs in the balance. Dragon Blade, the second book in J.D. 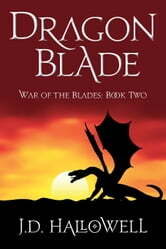 Hallowell’s War of the Blades, is the epic conclusion to the story begun in Dragon Fate. Delno Okonan, his draconic bond-mate, Geneva, and their allies among the Dragons and Riders are once again caught up in events controlled by unseen forces. 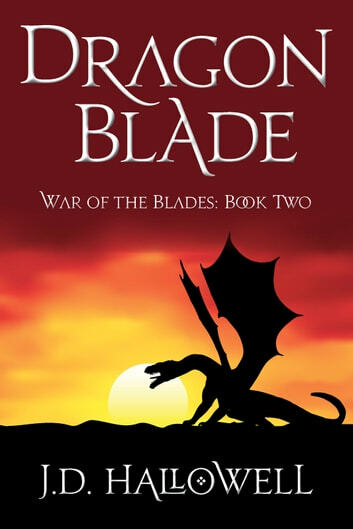 They must uncover the real secrets behind the death of a senior Dragon Rider and the sudden rise of the Roracks, ancient enemy of dragons and men, to defeat a threat that could destroy them all and leave the world they know forever altered. A great adventure with dragons and their riders! Excellent story in the same vein as the dragon riders of Perm. Well done and hopefully more to come. 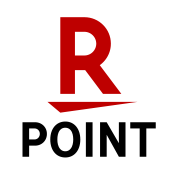 Excellent good read keeps you reading for more. Well written story of the triumph of good versus evil. Also Dragons. What's not to like about Dragons. The perfect end to war of the blades. Hopefully this author will someday do another book in the series. Thoroughly enjoyable books. Love this and the one before. Story with some meat on the the bone. Feel good book, which is what a good book should do. If I want reality I'd stick to by bank statements. Definitely recommend this and book 1 before it.